Over the winter holidays I’m always confronted with the Terry’s Chocolate Orange at the checkout. And somehow, despite having an abundance of orange-flavored chocolates throughout the year, I still manage to miss it! 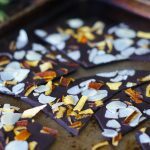 I came home from one grocery haul determined to make a DIY orange chocolate, but somehow by the time I got around to it I no longer felt like candy. So instead I went for a grown-up treat: a delicate balance between dark bittersweet chocolate and the bitterness and beautiful flavor of orange peel. Couldn’t have diverted further from a sweet and milky Terry’s, but was really happy with the end result nonetheless because you can’t go wrong with chocolate + orange in any shape or form. And sometimes you need some less sweet options. 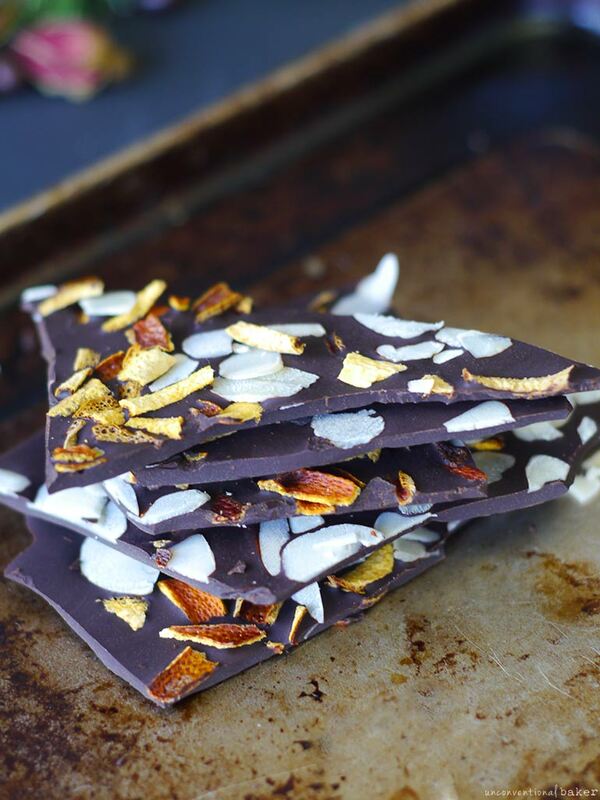 Plus for years now I’ve been seeing recipes around of tiny strips of orange peel dipped in chocolate. They always look delightful, but who am I kidding — I would never be satisfied with a tiny thin strop of orange peel. Plus a bark seemed like a much more substantial / less finicky option in this case. But fair warming: this recipe is for a real bittersweet lover only. The orange peel is intense! You can use a dehydrator instead of the oven here to dry out the peel if you prefer to keep the recipe raw. P.S. 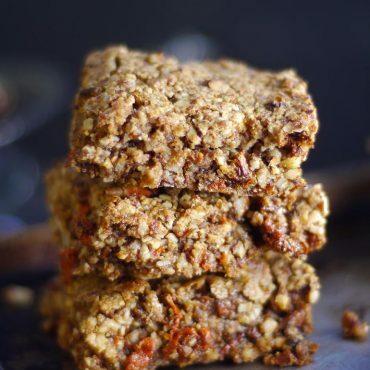 to make this recipe I used a dark chocolate bar I already had on hand (90%). 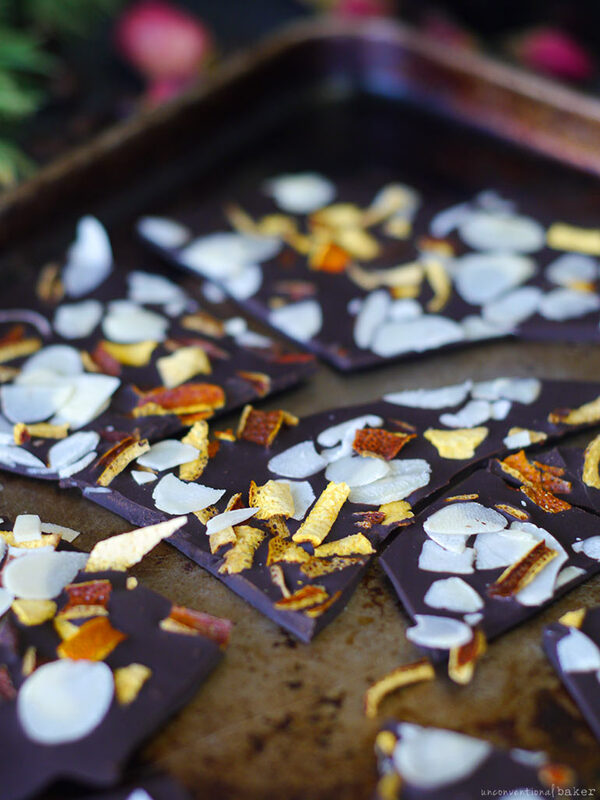 To keep the recipe refined sugar-free, go for a coconut-sweetened chocolate, or a raw chocolate bar. Or make your own. 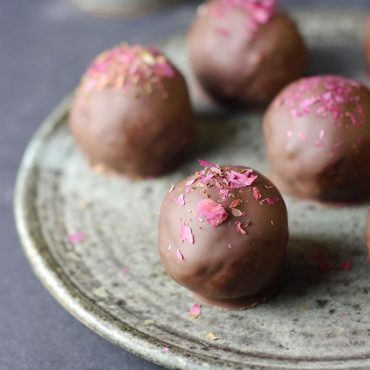 You can use something like this magic shell recipe (though it will be meltier) or go for the mulberry chocolates recipe in Unconventional Treats as a base. 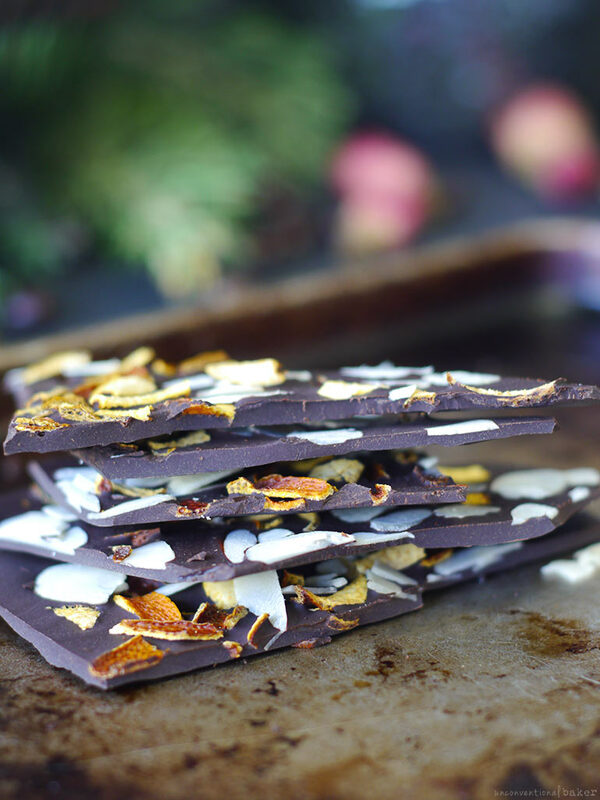 A grown-up treat for those who love chocolate orange… a delicately balanced dark bittersweet chocolate bark with natural orange peel. Gluten-free, vegan. Pre-heat oven to 350F. Line a small cookie sheet or baking dish with parchment paper, set aside. Peel your orange with a vegetable peeler or a knife (just as you would a potato / apple). Keep the peel on the medium – thin size (i.e. no need to peel off deeply all the way to the actual orange). Then place the peels on a cutting board and cut into thin strips(like ⅛” wide or so, so you end up with long strips). Spread out on a the prepared baking sheet and bake in a pre-heated oven for 40 mins – hour, until the peel looks crispy and starts to brown up around the edges (time might vary depending on your orange slice thickness / oven temp steadiness, etc. so just keep an eye out until done. Remove from oven and cool off completely on a rack. The peels should be very crunchy (not leathery) once cooled — if they’re not, return to oven and bake longer. NOTE: alternatively you can dehydrate the peel overnight in a dehydrator instead. Break up the peel into tiny pieces by hand. Set aside. Melt your favorite dark chocolate bar (or see notes above for DIY alternatives) in a double boiler. 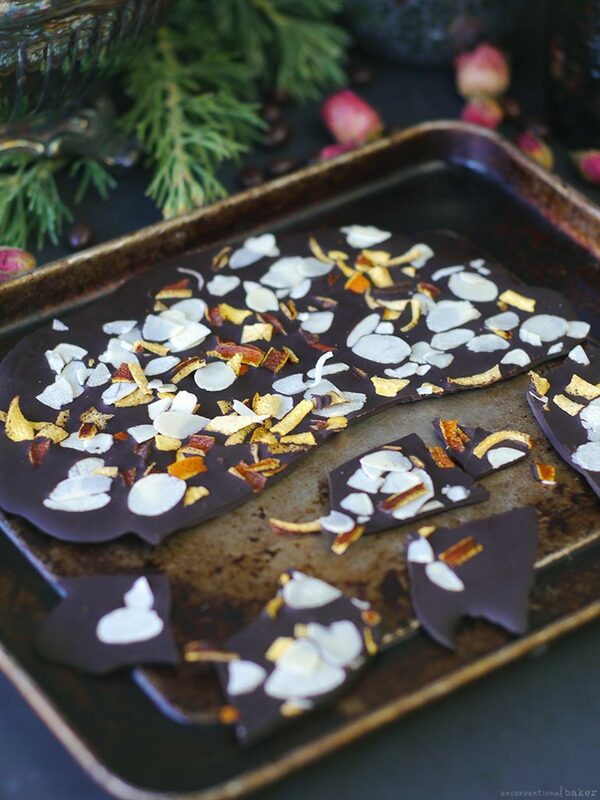 While chocolate is melting, prepare a small metal tray / cookie sheet by lining it with parchment paper. Make sure the tray is at room temp. Once chocolate is melted, pour it out onto the parchment paper and allow it to spread out into a thin layer (can help it along with a spoon to even it out). Sprinkle with orange peel bits and almond slices, if using. Place in the fridge for 20 mins to set. Once firm, break up into shards and enjoy. If you used tempered chocolate (i.e. most commercial chocolate bars), this should keep well at room temp, otherwise if you used a DIY chocolate or a raw chocolate for the base, you’ll want to keep this refrigerated (or frozen for a crunchy bark — that’s how I love mine). You are so creative and I’m jealous that you get to spend so much time playing (inventing?) in the kitchen. Plus, I’m still checking Amazon for your print book because unlike every other human in creation I still think real live cookbooks are easier. Was that a polite enough moan? Anyway, I’ve got a couple of unsweetened Ghiradelli bars that got bought by mistake and I’m thinking just a bit of coconut sugar and some careful tempering before adding the goodies would be lovely. Thank you so much, Laurel :) Working on that print book… ;) …but it’s not a fast process. Hopefully it’ll be ready sooner than later.